I get a lot of questions about what to do after P90X. This is a very good question as it was one I asked myself. When I completed P90X I was so pumped with my P90X results I decided to go and do another round of it. After round two, P90X was starting to become a part of my lifestyle. 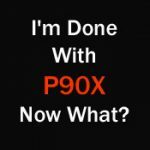 When … [Read more...] about What To Do After P90X?